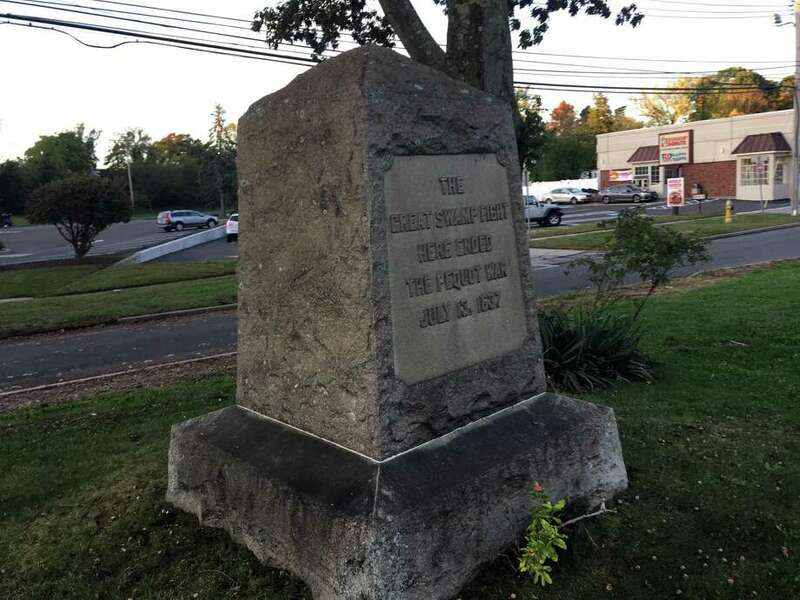 A large stone marker sits in front of People's Bank and across from the 7-11 Shell gas station on Post Road in Fairfield, where the Pequot Swamp fight ended in 1637. If you drive into town from various directions, you will see signs that show the Rotary Club and when it meets, the Kiwanis Club and when it meets, and then the sign that says Fairfield and when it first met. It says Fairfield was incorporated in 1639. Obviously, there were Native Americans here for thousands of years before that — and a recent study is wrapping up on what happened before 1639. They are looking in particular at the 1637 Battle of Munnacommuck (Pequot) Swamp in Fairfield (known as Sasquanicut those days). Last Sunday, Nov. 4, at 4 p.m. at the annual meeting of the Sasquanaug Association, David Naumec — military historian, archaeologist and senior researcher at the Mashantucket Pequot Museum — updated the public on the study, and most notably recent artifacts discovered at Southpark Park, a Sasquanaug Association property and part of the former battlefield of the Pequot Swamp fight. The presentation was much more thorough, but I will try to explain what happened and why it led to the incorporation of Fairfield. I’m sure I will miss important points. I am not a historian, but this is what I have put together. In 1637, the English settlers are chasing a band of Pequot Indians from the eastern side of the state. They chased them into this area where the Pequots had taken refuge in a non-Pequot native village in what is now Southport. The English surround them and push them into the adjacent swamp area. Much of Southport was swamp then. The English line is what now is I-95 and the Post Road — the Pequots are in the swamp. After some negotiation, many native women and children are allowed to leave. Unfortunately, some of these are sold into slavery. The settlers were worried that the Pequots will escape again, so they press their advantage. The English are correct. After much of the fighting, what is left of the Pequots escape and make it all the way to New York State, where they are captured and killed, and the Pequots never again pose a serious threat to the settlers. The settlers return to the northern and eastern part of the state until someone remembers how nice the non-swamp areas around here were, and they return and have their incorporation meetings in 1639. The settlers multiply and start filling in the swamps. This was back when wetlands were called swamps. Over the next 300 years, the former wetlands are transformed into farms, businesses, and homes. Then in the 1950s, I-95 comes in and buries what is left of the northern edge of the battle area. This area is important, because this is where the English are positioned. Later when archaeologists like David search for historical evidence, the English areas will be the richest for artifacts because they hold the majority of the metal used on the battlefield. Metal lasts longer than organic material, can be picked up by metal detectors, and is more easily identified. At some point, a large stone marker was placed out on the Post Road at the northern edge of the battle grounds. It now sits upon a grass island in front of Peoples Bank and across from the 7-11 Shell Gas station on the Post Road. People often wait for the bus there. Pequot Avenue is named after the band that fled from the eastern part of the state and just stayed here a brief while — also we have the Pequot Library and Pequot Liquors. We used to also have the Pequot Motel, which has been transformed into the more upscale condo complex Pequot Landing.